Known as bolinhos in Portuguese ("little cakes"), these croquettes are Daniel Boulud's take on a classic Brazilian bar food. 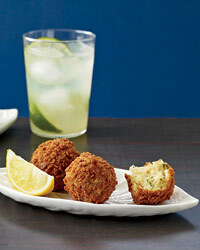 Crispy on the outside and fluffy on the inside, with plump chunks of salt cod, they are a terrific match for zippy caipirinhas. 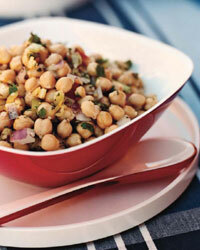 Serve Colicchio's fresh-tasting chickpea salad with warm, soft pita bread to soak up the olive oil dressing. 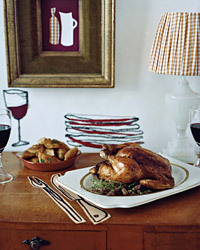 To give the bird extra flavor, Achatz rubs garlicky butter under the breast skin and packs the cavity with more garlic, plus thyme sprigs and lemon quarters. 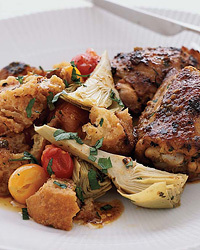 After the chicken is cooked, he uses the juices to make an intensely flavored sauce that's delicious with the bird and the hearty pierogies that go with it. 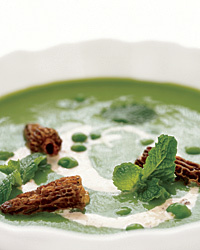 Humm tops his wonderful sweet pea soup with morel cream that's been frothed with an immersion blender. The recipe here simply calls for swirling the cream into the soup. Indeed, the cream is so intensely mushroomy, you may be tempted to eat it on its own. 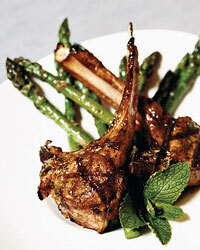 After Wilson marinates the lamb in an oil scented with marjoram, cumin and fennel seed, he grills the meat until slightly crusty, then serves it with asparagus drizzled with mint vinaigrette.